A representative of the safe and confidential cryptocurrency Monero will arrive in Ukraine for the first time ever. 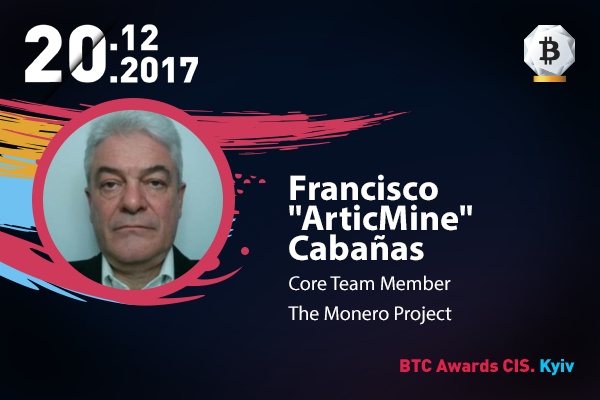 On December 20, Francisco Cabanas, a Monero top expert, will become a special guest of the first BTC Awards CIS ceremony and a participant of the Coins discussion panel. Francisco holds a PhD in Physics and has extensive business and non-profit experience. He has actively researched and invested in cryptocurrencies, since 2011, and focuses on the economic, social, regulatory and long-term economic viability aspects of cryptocurrencies. Security. Users must be able to trust Monero with their transactions, without risk of error or attack. Monero gives the full block reward to the miners, who are the most critical members of the network who provide this security. Privacy. Monero takes privacy seriously. Monero needs to be able to protect users in a court of law and, in extreme cases, from the death penalty. This level of privacy must be completely accessible to all users, whether they are technologically competent or have no idea how Monero works. Decentralization. Monero is committed to providing the maximum amount of decentralization. With Monero, you do not have to trust anyone else on the network, and it is not run by any large group. An accessible “Proof of Work” algorithm makes it easy to mine Monero on normal computers, which makes it more difficult for someone to purchase a large amount of mining power. Our open blockchain-based voting starts on December 1. You are welcome to participate in this grand event and determine the best coin of 2017! BTC Awards CIS — recognizing the best! The event will feature four discussion panels devoted to the most topical issues – Tokenization, Legal, Mining, and Coins. For more information, follow the link.